Director Betty Salamun’s WATER MEASURES dance concert explores the scientific phenomena of en-ergo – the structural memory of water. Acting as a transmission source, water connects all living things, collecting from and passing on information between all life forms. Flutist Rick Aaron and drummer Scott Wendel turn-up the heat for HOT H2O taking the inter-species conversation from Genesis, through the trouble we’re in ‘right here in river city’ [with a capitol T that rhymes with P that stands for PLASTIC!] and building to the next world-wide water issue – ‘Hot Commodity’. Inspired by the scientific prose of Clifford Mortimer in “Lake Michigan in Motion: Responses of an Inland Sea to Weather, Earth-Spin, and Human Activities” Betty Salamun and dancers choreograph FORMATIONS. Traversing the Lakes’ geography on Brad Dutz’s jazz score, the trilogy explores the glacial beginnings of the Great Lakes, the effect of the divide on land and people, and present-day evolutionary changes to the Lakes from sediment. Susan Borri and Betty Salamun premier “EARFUL”, a video on the impact of freshwater and Lake Michigan voiced by Milwaukeeans and reprise Video SPLASH DANCE, the freshwater flash mob developed for Wisconsin Science Festival. For SPLASH DANCE: Redux!, everyone is invited to come-on down and dance. Company dancers will teach interested audience members parts of the freshwater flash mob during intermission. Following intermission, DanceCircus dancers and ‘guest’ performers will dance to Video SPLASH DANCE! individual and collective connections to our own Great Lake-Michigan! Coming in 2016, Confluence the story of the rivers that bring us together. into what holds us together – despite differences – as a community. multi-media dance-theatre performances inspired by the people and world around us. Surface Tension dancing the Great Lakes–surface of sails and percussion instruments, depths of poetry and soaring beauty of a cappella voices to heal the waters. DanceWorks Studio Theatre 1661 N Water St.
TICKETS: $20 Premium Reserved, $15 General Admission, $10 student/senior/artist rate available at DanceWorks Studio Theatre BOX OFFICE at 414-277-8480 or go on line at Danceworks. For more information on the concert contact dancecircus.org at 414-277-8151. DanceCircus breaks through surface tension—a scientific phenomena of the attractive forces of molecules in liquids creating a thin elastic skin–in dances, poems and music April 12-13, 2014. Visual artist Melanie Ariens puts the surface of the Great Lakes on the surface of sails as a backdrop for dances including Armilla about a mythical city which has no surfaces—no floors or walls–only the water pipes. Suzanne Rosenblatt’s poem The Dark Side contrasts the surface beauty of the Lake to it’s hidden currents just as our skin seeks to hide our emotional currents. Water is a resource that awakens our creativity, inspires our hearts and challenges our minds to solve our water problems. Wade in the Water, a dance from the 2008 DanceCircus production to a cappella voices, uses original lyrics by DevaNation for healing Lake Michigan. Composer Mark Mantel’s music from the surface of unusual percussion instruments adds depth to SURFACE TENSION, Lake, Reservoir, Ocean, Stream, River. These dances look at both sides of the surface, water/air, above/below, public/private, invasive/non-invasive, commercial/community. The performance includes Walt Whitman’s To Think of Time which carries a poignant reflection on death and infinity dedicated to the late Peter J. Salamun, Artistic Director Betty Salamun’s father. DanceCircus thanks Milwaukee County (CAMPAC), UW-M 50th Year Alumni Research Incubator Project, City of Milwaukee Arts Board with funds from the Wisconsin Arts Board and individual donors for their support of Surface Tension. This concert is part of the DanceCircus Water Measures Project, a multi-year project engaging people of all ages throughout the metropolitan region. Surface Tension is a metaphor for community-wide investigations into what holds us together – despite differences – as a community. This journey explores individual and collective connections to our own Great Lake-Michigan! For nearly 40 years, DanceCircus under the artistic direction of Betty Salamun, has created and performed multi-media dance-theatre performances inspired by the people and world around us. 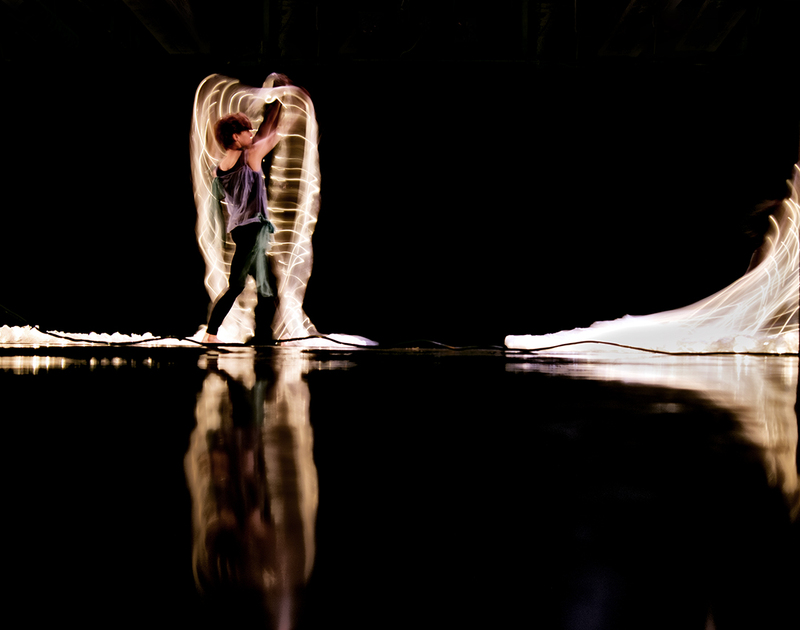 A luminescent concert of dances, visual art, puppetry, music and the properties of light itself. DanceCircus presents “LIGHTshadow” April 6 & 7, 2013 at DanceWorks Studio Theater. Investigating light and shadow in collaboration with guest artists, composers, dancers and performers. REFLECTION, a quintet, plays with the symmetry and mirroring of mandala forms. Artistic Director Betty Salamun explores the essence of light – movement, mass, speed and heat – in a talk-dance. A collaboration with artist and guest performer Anja Sieger weaves together shadow puppets and dancers delving into the human psyche. Visual artist Sherrod Milewski lights the Aurora Borealis with her vivid translucent flowing costumes for the dancers of SOLAR WINDS performed to original music by Wylie Hufti. TALK-BACK with artists and dancers follows each performance. Three performances at DanceWorks Studio Theater, 1661 N. Water Street, Milwaukee 7:30pm Saturday April 6, 2013, 3:00pm and 7:00pm Sunday April 7, 2013. TICKETS: $25 Premium Reserved, $20 General Admission, $15 student/senior/artist rate available at DanceWorks Studio Theatre BOX OFFICE at 414-277-8480 or go on line at Danceworks. For more information on the concert contact dancecircus.org.